With just months after the release of the Nike+ FuelBand SE, Nike shows it's still working hard to innovate on their popular FuelBand series and to try and keep a strong grasp on the all-day fitness tracker market, competing against Fitbit, Jawbone and others. We may be Vibram Powered, but that doesn't mean we're tied to just Vibram gear. It also gives us the option to review and discuss products that mesh well with Vibram FiveFingers, and in this case, it's the Nike+ FuelBand SE (Second Edition). So let's dive in and see if it's worth the upgrade to its early FuelBand adopters and if it's worth the price and use for newcomers. First off, as much as I adore Vibram, I also love Nike. Even most of my fitness gear is Nike or MEC (also a fan of them). If you aren't familiar with the Nike+ FuelBand, it essentially tracks your movements throughout the day, which get calculated/converted in to NikeFuel. It's currently being sold at $150 which some argue is quite the price tag for a "glorified pedometer", I would say $100 would be a more reasonable price, but the FuelBand is more than just itself, with it also offering the Nike+ network which is also hold a major role in Nike+ since it's the best and primary way to collect NikeFuel. NikeFuel: The more you move, the more you burn. 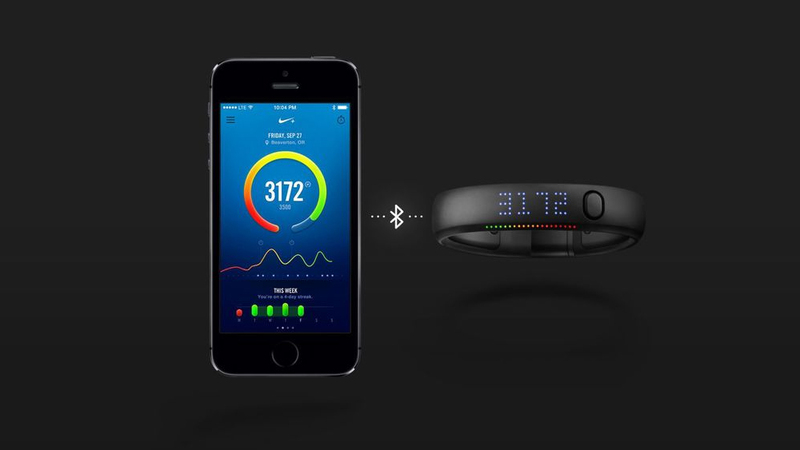 NikeFuel is a proprietary unit of measurement for tracking activity. To see what your FuelBand has tracked, you can either sync it up with the desktop app, or the iOS app (via Bluetooth). I know what you're thinking. How does a big company like Nike not offer a FuelBand app for Android or Windows Phone? Only Nike knows that. Maybe they prefer exclusivity or that Apple has worked out a deal with them. The only thing different from the iOS app and the desktop app is that the iOS app obviously offers a more convenient way to sync up your data, and is currently the only way to take advantage of new Nike+ Groups which was released with the new FuelBand SE. With the FuelBand, and NikeFuel, its based around your individually set daily goal which is suppose to help motivate you to meet each day and stay active. One reason why the FuelBand SE is your best friend if you're a minimalist is its minimal design. Many people confuse it just a normal wristband since it's fairly skinny and has similar rubberized material as a normal wristbands use. Offering a compact LED screen and one button to navigate through it's on-device features. There are two separate parts to the LED display. 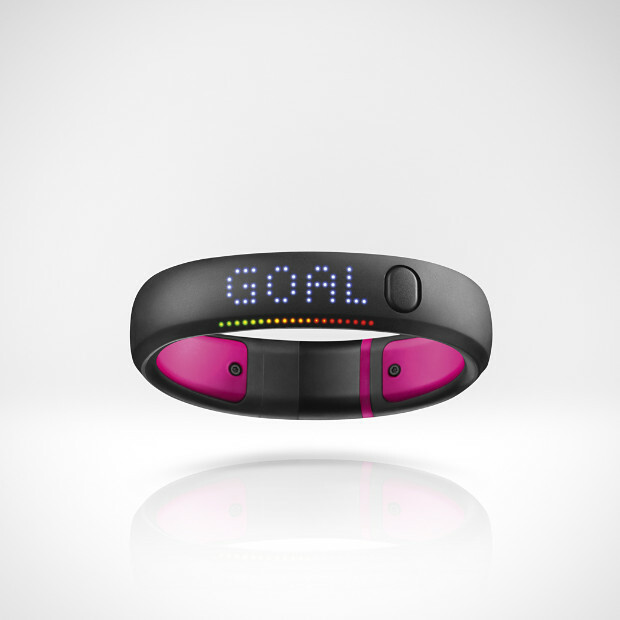 The main part displays your NikeFuel that you've burned so far within the day, as well as time, calories, and steps. 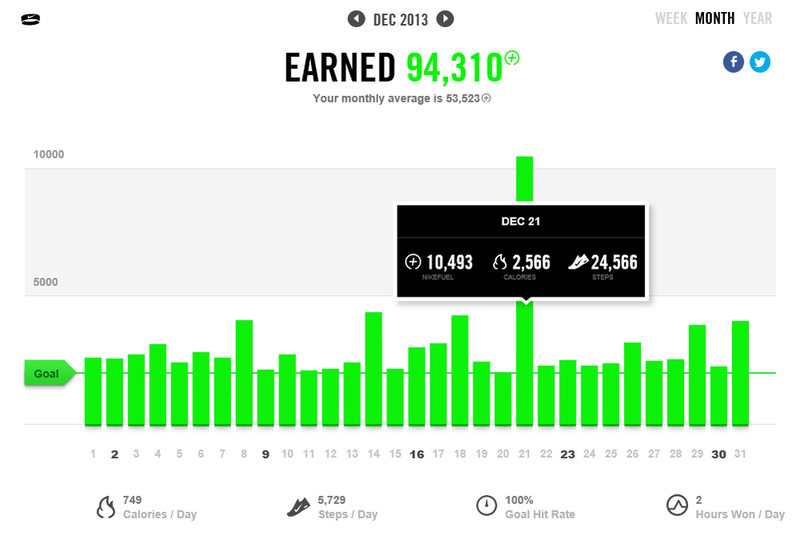 The second is a horizontal line which visually shows your NikeFuel goal progress. As well as it looks, it feels just as great. It's comfortable due to its rubberized materials and is fairly light for what's inside of it. It comes close to feeling like you're wearing just another wristband. For a wristband, it has quite a few features, both on and off device. On the the device, like previously mentioned, it tracks and displays your movements by NikeFuel, steps, calories, time, and the newest one, 'hours won' - Hours Won are the hours in your day in which you've earned six or more NikeFuel per minute for at least five consecutive minutes. Hours Won is a pretty smart move by Nike since no one else in the market as it or something similar. It's main purpose is to get you to stay active throughout the day, instead of just going out in the afternoon, meeting your goal by playing cup in a ball and then going back to the couch. So it's definitely an effective and useful stat to display. Another new feature is sessions. You can now start and stop sessions on your FuelBand SE which is great for tagging your activities. Nike even went the extra mile with specific sessions by allowing you to change your intensity of the session, since some activities can be hard to track with just hand movements (weight lifting, etc.). So if you worked up a good sweat when lift weights, you'd change the intensity to high which raises your NikeFuel count for that session or if you were lazy and took many breaks, you'd set the intensity to low. Right now, you can only start and stop an untagged session on your Fuelband SE. You have to sync it up with your iPhone of PC to tag your sessions, edit your intensity and the time (for example: if you forgot to start tracking a session for the first 5 minutes, you can change that when editing). This is where the information has a fun time being displayed - off the device. When you sync up, you can use the iPhone which has it's own special Nike+ FuelBand app which has the Nike+ network built right in to the app or the PC which has a small standalone app with uploads the FuelBands, as well as giving you some options to change/customize the FuelBand settings, once it uploads the data, your browser pops-up with the Nike+ login page. Nike+ is its own special social network for you and your friends to compete, support. It's not just socially-focused, most of the platform is for yourself and to display your tracked data just for your own eyes. You are able to share your daily activity and the trophies you've won via Twitter and Facebook. One problem is how Nike+ is so exclusive. To see a profile, you must be a member and logged in. When you share a trophy you just unlocked, 3 quarters of the page is just promoting Nike+ and barely as anything to do with your trophy. It doesn't even show the trophy on the link you share. And for sessions, they are only viewable for yourself, not even your friends can see them. So they really need to open up profiles to the public, but also give you options to hide certain information (daily activity, sessions, etc.) from the public/friends/etc. New to the social network, Nike+, are Nike+ Groups but it's completely exclusive to the FuelBand iOS app which is extremely disappointing and makes me wonder they don't offer it through the browser as well? Moving on from its silly exclusivity, you can join groups, and groups can have a set goal to reach for the week that factors in everyones NikeFuel for that specific time period. It also contains a feed of the members that automatically posts when a member has unlocked a trophy or completed a session which then the members can comment on. So you can see how Nike+ is slowly turning in to the fitness-Facebook. But once again, too bad that those strong social features are only limited to iOS users. The FuelBand SE comes with a strong and consistent performance. I'm always amazed at out how accurate it tracks my movement even though it's only on my wrist. So there's no problem there. Nike even claims to have improved the tracking performance with this release. The battery lasts for 3-5 days, but if you're like me - you don't have an iOS device, you have to sync it up with the PC using a cable ( or you can also just plug the FuelBand in directly to the PC) which of course charges it at the same time - so the battery never has a chance to die or even get down to 50%. Right now, the only problem with the performance is in the Nike+ network. Sometimes trophies don't become unlocked when they should have. I've also noticed my daily goal streak being reset back to 0. Hopefully they zap these bugs out of the software soon because it can be quite the damper when you're going for the 365 streak trophy and notice your streak has been reset when you're at 126 days. For durability, it lasts and lasts well. The materialized rubber makes it smooth and soft, so it absorbs impact well. With it being a bit soft, it's also means it can get scratches. You don't have to be too careful with it, just don't be too rough with it if you want it to keep it looking purdy. Throughout all the years I've had my FuelBands, I've had only minor scratches on them and I'm not exactly the most careful person. You might get the odd one every once and awhile, but they seem to buff themselves out over time. Although it isn't waterproof, they did make the SE more water-resistant. So if you like to surf or swim, you're going to have to do it without your FuelBand. Hopefully the next FuelBand edition will be completely waterproof. Overall, the FuelBand SE is a strong competitor in the market for all-day fitness trackers. Some may say it's an glorified pedometer but they're mostly just thinking of the FuelBand itself. The FuelBand is much more than itself. It opens you up to the Nike+ network and Nike+ is definitely ahead of its competitors, even though it still has some bugs within the social network. Think of it has a fairly pricey, but sleek and durable key to a free luxurious sports car. Come check out the Vibram Powered Nike+ group if you're a Nike+ user, too!